The time has come once again for the mass slaughter of dolphins in Taiji, Japan. Bottlenose dolphins are the prime target, their meat sold as a culinary delicacy and their bodies sold as amusement park entertainment. The fishermen who conduct the slaughter lure the dolphins into a secluded cove from which there is no escape. Terrified and exhausted, the dolphins are systematically and brutally bludgeoned to death. By the end of each hunting season, which lasts from September to April, close to 1,000 dolphins are killed for slaughter and dozens more are sold into captivity. Those that don't die from the brutal attack generally drown on the way to the slaughterhouse. Nursing mothers aren't spared, babies aren't spared. The Japanese government has the ability to condemn this bloody event and punish those who participate. But thus far—with tens of thousands of dolphins killed in the last few years—they have done nothing about it. 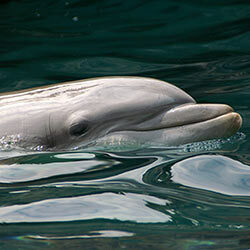 Sign the petition asking the Japanese government to prohibit the dolphin slaughter once and for all! The award-winning 2009 film The Cove follows a high-tech dive team on a mission to discover the truth about the Taiji, Japan dolphin capture trade. Utilizing state-of-the-art techniques, including hidden microphones and cameras in fake rocks, this shocking documentary uncovers the massive ecological crimes being committed each year. See the trailer below and spread the word about the annual travesty in Taiji. I am appalled that you have continued to allow the dolphin slaughter that takes place in Taiji starting every September. Every year thousands of dolphins are slaughtered by Japanese fishermen in order to keep the fish populations plentiful and to sell the dolphins' meat. The fishermen employ brutal methods for killing the dolphins. When the slaughter commences, they lure the dolphins into a cove from which they cannot escape. They then throw spears at the dolphins and stab them. Some of the dolphins are taken to zoos and aquariums where they will live out the rest of their lives in captivity. Population control is simply no excuse to brutally murder these beautiful and majestic creatures. I find it appalling the dolphin slaughter has been allowed to continue for this long and beg you to reconsider your support of it. Please cease to support this inhumane act. We need to advocate for these animals if we hope to end this disgusting act of violence before any more precious dolphins are killed for no good reason. 7/25/2014: Despite fervent worldwide opposition, the Japanese government has permitted the annual slaughter of thousands of dolphins in Taiji for nearly 50 years. September marks the start of the hunting season. Now is the time to speak out! That's 55,039 signatures! Let's keep the ball rolling.